A Wenger dryer or dryer/cooler can be almost anything you want it to be since every model is designed and sized for the specific application. It's simply a matter of selecting the size and capacity, which ranges from 0.2 to 22 tons per hour, and choosing the appropriate options. Wenger actually developed the industry's first horizontal dryer in the 1950s in response to the damage vertical dryers available at the time were causing to feed pellets dropped through the air column. Wenger engineers were convinced they had a better way. Rather than being dropped, the product being dried in a horizontal dryer is spread on a belt that moves through the dryer at a predetermined speed. After the heated air is passed through the bed of product at the appropriate speed and temperature, a portion of it is exhausted to carry away moisture, while the remainder is mixed with fresh air, reheated and passed through the product again. 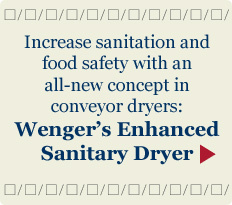 Wenger customers have a myriad of choices when the application calls for a horizontal dryer. Options include our widely trusted TrueTemp™ dryer series, as well as our new Enhanced Sanitary Dryer that was designed for greater sanitation; less potential for cross contamination and bacteria build-up, and a reduction in the amount of production time lost due to off-line inspection and cleaning. Dryer width and length – length is generally variable by module number. Single or dual plenum conveyor design. Single-, double- or triple-pass product movement. Multiple airflow directions and configurations. Process control – manual, Automated Process Management (APM) or APM Basic. Heat source– natural gas, LPG, steam or even electric coils. Material type – mild steel with stainless steel in high-corrosion areas, mild steel with stainless steel in product contact areas or all stainless steel. Conveyor construction – hinged or overlapping with slotted or perforated trays. Fine-mesh polyester or stainless-steel screens are also available. Product agitation – manual or automatic product agitator, and/or lump breaker. Product spreader – chain driven or direct drive oscillating spreader, chain driven or direct drive oscillating belts, leveling rake, leveling auger, biased slot vibration, etc. 714 Main Street Sabetha, KS 66534-0130 U.S.A.